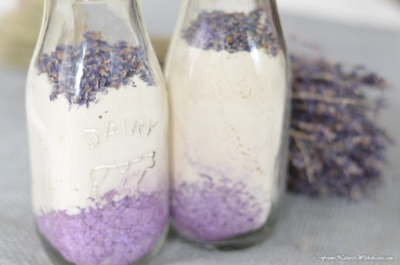 DIY Layered Milk Bath Makes for the Perfect Gift! 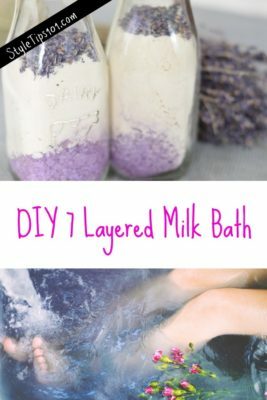 This DIY layered milk bath looks SO pretty in a mason jar, it will be very hard for you to even give it away! Made with all natural ingredients, this layered milk bath makes the perfect gift for a loved one, but will also look amazing in your bathtub as well! This rich layered milk bath will yield one 16 ounce bath soak and is comprised of some super awesome ingredients that will leave skin silky soft and glowing after just one bath! In a small bowl, mix the dead sea salts with whichever essential oil you’ll be using. In another bowl, mix the powdered goat milk with cocoa powder and/or dried chamomile. In a glass jar, add 1/2 cup of of the powdered mixture creating an even layer at the bottom. Next, add 1/2 cup of the dead sea salt mixture, and follow up with grated cocoa butter, dried lavender buds, and/or dried rose petals. Repeat process until all ingredients are gone. Press down gently and close jar. Wrap the jar with a ribbon if giving away! Pour entire contents into a warm bath, sit back, and enjoy the amazing scents! Place a strainer on your bath’s drain to capture the leftover petals and buds.